Fable hits US stores in just over a week, but we've already got word on a follow-up along with news on Lionhead's top-secret project, Dimitri. With the massively anticipated Fable hitting US stores soon on September 14th (and UK release to follow on October 8th), there's a lot to be excited about for Lionhead fanatics right now (and we've been able to count a handful of fansites dedicated entirely to the UK developer's output). The Lionhead news just keep coming. Don't blame Peter though, he didn't say anything. 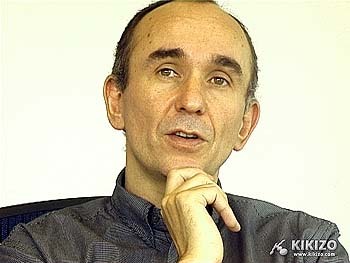 The powerhouse development outfit, with its potent and growing satellite studio scheme, is led by game design legend Peter Molyneux, who recently spoke extensively to Kikizo in two exclusive video interviews, the first focussing purely on Fable, and the second on a variety of other Lionhead projects including Black and White 2 and The Movies. The existence of Project Dimitri, referred to simply as Dimitri in Lionhead territory, has been known about since as early as May 2001, when Peter first mentioned the project at that year's E3 convention. But nothing - hardly a single detail - has been spoken about it ever since. And predictably, nobody seems to have asked. During our recent time at Lionhead, we had caught more than a hint of a vibe that Dimitri could possibly be the firm's biggest undertaking to date, eclipsing even the mighty Black & White and Fable projects. And breaking the silence surrounding the game for the first time, Molyneux revealed, "I think [Dimitri] is probably Lionhead's flagship technology game. Where Black and White was our flagship technology game, and had most of our technology in there and most of the unique ideas in there, [now] I think Dimitri is." And just to be tantalising, he added, "But it's also our simplest." Peter enthused, "When you're working on something as ambitions as Dimitri - and it's so easy to describe what Dimitri is, and I'm just gonna be tantalising here, is that, if I were to describe it to you, you would have so many questions about it, and unless I could actually show you the game physically working, and show you how you do these amazing things, then you just wouldn't believe me. You'd think I was mad." And Peter, determined to be a more responsible figurehead for the developer as viewers of our video interview with him will recall, is trying his best not to talk any more about the game. He told us, "It's about time I was less like a kid and more like a professional... I should not spill every detail about a game whether or not it's implemented." Having said that, he did continue, "Dimitri is at a stage where if I told you about it I would be talking more about the ambitions of what the game is, rather than the reality of what's in the game. But we're close to getting Dimitri to a stage where you can see it, touch it and feel it." And our intriguing glimpse at what Dimitri might be didn't end there. After the interview, Molyneux revealed to Kikizo that the codename Dimitri originates from the name of somebody in his own life, named Dimitri - his godson, in fact. And concept drawings that decorate the office walls of Lionhead show expansive landscapes, some with somewhat curious names, that we're not allowed to reveal or elaborate on because we're speculating one of them might be the actual name of the game - but we know they are from Dimitri, because Peter told us. Which means Dimitri is from the Fable team. He concluded, "It's ambitious in a completely different way to what you'd expect." The excitement didn't end with discussions about Dimitri. In fact, we also caught wind of a Fable follow-up, which we can reveal is known as Fable 1.5, and began development before Fable went gold a couple of weeks ago. Lionhead's PR people were quick to point out that Fable 1.5 is "unconfirmed" - but according to Big Blue Box staff, it's entirely real. We don't know much about what Fable 1.5 actually is, but one can guess it's an update of some kind, as opposed to a full-on sequel (as Peter put it in our first video interview with him, the sequel would need to be as "fresh and original" as the first game). In fact, it was when discussing the possibility of downloadable content for Fable, that a Lionhead designer mentioned the arousing existence of Fable 1.5 - suggesting it could be an Xbox Live update - though we wouldn't rule out the possibility of it being the long-rumoured PC version of the game either. And obviously, we wouldn't be surprised to see a full-on Fable 2 at some stage either. After all, there's always Peter's comment from our first interview to consider: "If we were thinking about a sequel... then co-op play and online would be one of things we'd think of putting in there." And no, none of this relates to the censored portion of the second interview... that, we really can't talk about - Lionhead said so. Stay tuned for our verdict on Fable as the game nears release, and see our in-depth hands-on with the near-final game if you missed it.